Mohamadi, A., Yaghoubi, S. (2017). A novel bi-objective reliable location routing model considering impedance function under demand-side and supply-side uncertainty (A Case study). 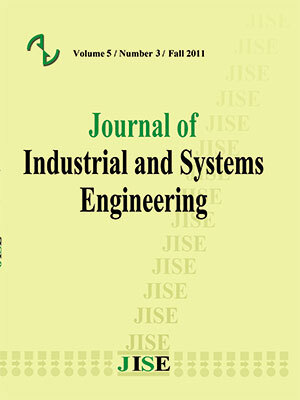 Journal of Industrial and Systems Engineering, 10(Issue 1), 35-49. Ahmad Mohamadi; Saeed Yaghoubi. "A novel bi-objective reliable location routing model considering impedance function under demand-side and supply-side uncertainty (A Case study)". Journal of Industrial and Systems Engineering, 10, Issue 1, 2017, 35-49. Mohamadi, A., Yaghoubi, S. (2017). 'A novel bi-objective reliable location routing model considering impedance function under demand-side and supply-side uncertainty (A Case study)', Journal of Industrial and Systems Engineering, 10(Issue 1), pp. 35-49. Mohamadi, A., Yaghoubi, S. A novel bi-objective reliable location routing model considering impedance function under demand-side and supply-side uncertainty (A Case study). Journal of Industrial and Systems Engineering, 2017; 10(Issue 1): 35-49. Reliable location routing problem considers a location problem and a vehicle routing problem in order to select the optimal location of facilities and at the same time the optimal routes for vehicles considering the unexpected failure for facilities in which, all facilities may fail with a probability. In this paper, a bi-objective mathematical model has been developed to minimize the total costs and minimize expected value of total impedance value-weighted travel distance. To approach the model to real world, two types of uncertainty in model have been considered: 1) demand-side uncertainty and 2) supply side uncertainty and also, impedance function has been utilized to operationalize the concept of accessibility in transport planning research. To solve the model, first Ɛ-constraint method has been used for multi objective solution and then we implemented a small-sized case study in an urban district in Iran. The findings offer managerial insights into how various system parameters affect the optimal solution. Aboolian, R., Cui, T., & Shen, Z. J. M. (2012). An efficient approach for solving reliable facility location models. INFORMS Journal on Computing,25(4), 720-729. Ahmadi-Javid, A., & Seddighi, A. H. (2013). A location-routing problem with disruption risk. Transportation Research Part E: Logistics and Transportation Review, 53, 63-82. Albareda-Sambola, M., Fernández, E., & Laporte, G. (2007). Heuristic and lower bound for a stochastic location-routing problem. European Journal of Operational Research, 179(3), 940-955. Avriel, M. (1980). A geometric programming approach to the solution of location problems. Journal of Regional Science, 20(2), 239-246. Chen, Q., Li, X., & Ouyang, Y. (2011). Joint inventory-location problem under the risk of probabilistic facility disruptions. Transportation Research Part B: Methodological, 45(7), 991-1003. Cui, T., Ouyang, Y., & Shen, Z. J. M. (2010). Reliable facility location design under the risk of disruptions. Operations Research, 58(4-part-1), 998-1011. Etemadnia, H., Goetz, S. J., Canning, P., & Tavallali, M. S. (2015). Optimal wholesale facilities location within the fruit and vegetables supply chain with bimodal transportation options: An LP-MIP heuristic approach. European Journal of Operational Research, 244(2), 648-661. Haimes, Y. Y., Ladson, L. S., & Wismer, D. A. (1971). Bicriterion formulation of problems of integrated system identification and system optimization. IEEE Transactions on Systems Man and Cybernetics, (3), 296. Hassan-Pour, H. A., Mosadegh-Khah, M., & Tavakkoli-Moghaddam, R. (2009). Solving a multi-objective multi-depot stochastic location-routing problem by a hybrid simulated annealing algorithm. Proceedings of the Institution of Mechanical Engineers, Part B: Journal of Engineering Manufacture, 223(8), 1045-1054. Herazo-Padilla, N., Montoya-Torres, J. R., Munoz-Villamizar, A., Nieto Isaza, S., & Ramirez Polo, L. (2013, December). Coupling ant colony optimization and discrete-event simulation to solve a stochastic location-routing problem. In Simulation Conference (WSC), 2013 Winter (pp. 3352-3362). IEEE. Horner, M. W., & O'Kelly, M. E. (2001). Embedding economies of scale concepts for hub network design. Journal of Transport Geography, 9(4), 255-265. Klibi, W., Lasalle, F., Martel, A., & Ichoua, S. (2010). The stochastic multiperiod location transportation problem. Transportation Science, 44(2), 221-237. Mohamadi, A., Yaghoubi, S., & Derikvand, H. (2015). A credibility-based chance-constrained transfer point location model for the relief logistics design (Case Study: earthquake disaster on region 1 of Tehran city).International Journal of Supply and Operations Management, 1(4), 466-488. Norouzi, K. K., Omidvar, B., Malek, M. B., & Ganjehi, S. (2013). Multi-Hazards risk analysis of damage in urban residential areas (Case study: earthquake and flood hazards in tehran-iran). Journal of Geography and Environmental Hazards, 2(7), 566-608. Peng, P., Snyder, L. V., Lim, A., & Liu, Z. (2011). Reliable logistics networks design with facility disruptions. Transportation Research Part B: Methodological, 45(8), 1190-1211. Snyder, L. V. (2003). Supply chain robustness and reliability: Models and algorithms (Doctoral dissertation, Northwestern University). Wei-long, Y. E., & Qing, L. I. (2007, August). Solving the Stochastic Location-Routing Problem with Genetic Algorithm. In Management Science and Engineering, 2007. ICMSE 2007. International Conference on (pp. 429-434). IEEE. Xie, W., Ouyang, Y., & Wong, S. C. (2015). Reliable Location-Routing Design Under Probabilistic Facility Disruptions. Transportation Science. Yeager, C. D., & Gatrell, J. D. (2014). Rural food accessibility: An analysis of travel impedance and the risk of potential grocery closures. Applied Geography, 53, 1-10. Zhang, B., Ma, Z., & Jiang, S. (2008, October). Location-routing-inventory problem with stochastic demand in logistics distribution systems. In Wireless Communications, Networking and Mobile Computing, 2008. WiCOM'08. 4th International Conference on (pp. 1-4). IEEE. Zhang, Y., Qi, M., Lin, W. H., & Miao, L. (2015). A metaheuristic approach to the reliable location routing problem under disruptions. Transportation Research Part E: Logistics and Transportation Review, 83, 90-110.